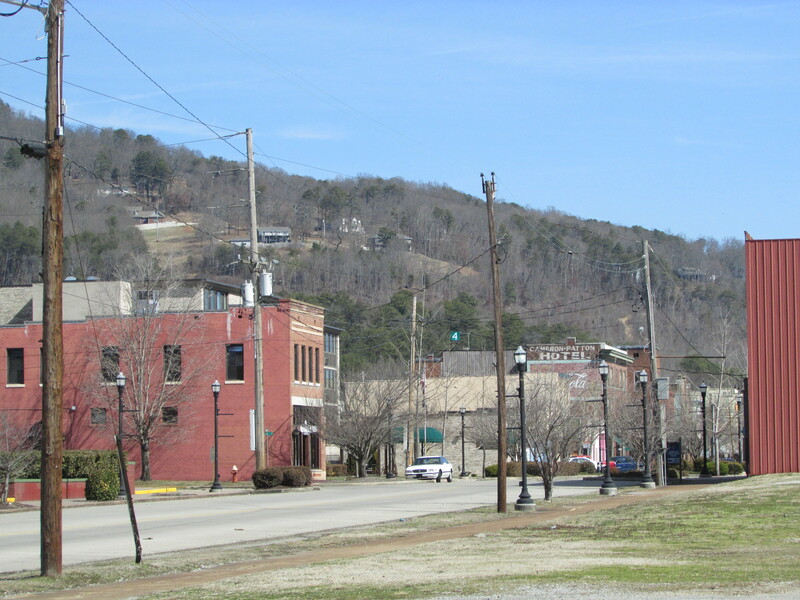 The first time I heard about the small town of South Pittsburg, Tennessee, I was living in Indiana and a friend mentioned that his mother’s family hails from South Pittsburg. I asked if there was a North Pittsburg in Tennessee and he was pretty sure there was not. Since then, I have learned that the closest thing they have to North Pittsburg is that Pittsburgh up in western Pennsylvania, one of my favorite cities. Years later, when I found myself living in north Alabama, I discovered on my first trip from Huntsville to Chattanooga that South Pittsburg is on Hwy. 72 on the Tennessee River nestled against the Cumberland Plateau and the Alabama state line. It is a little over an hour from my house. 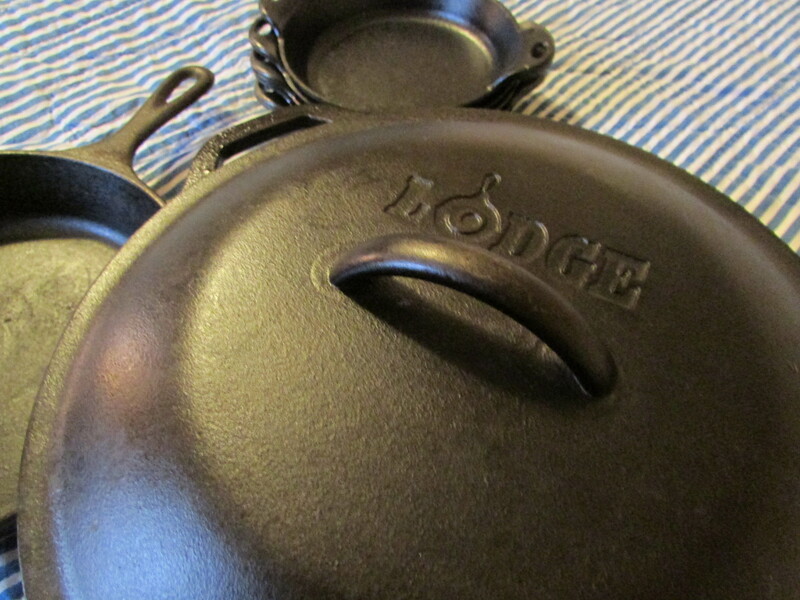 Most interesting was the discovery that South Pittsburg is the home of Lodge Manufacturing Co., makers of Lodge cast iron cookware – the only cast iron cookware still made in the United States. I try to have plenty of it on hand. Now, whenever I go to Chattanooga, I try to schedule a stop in South Pittsburg at the Lodge Cast Iron Factory Store near the foundry. For anybody who loves cooking with cast iron, this is a pilgrimage to take. The store is full of cast iron cookware in about any configuration one might imagine. I must show restraint in my purchases, but the place is filled floor to ceiling with shelves of cast iron temptation. The parking lot always has cars with tags from all over. On my recent visit, a Lodge cast iron hibachi grill was calling my name. 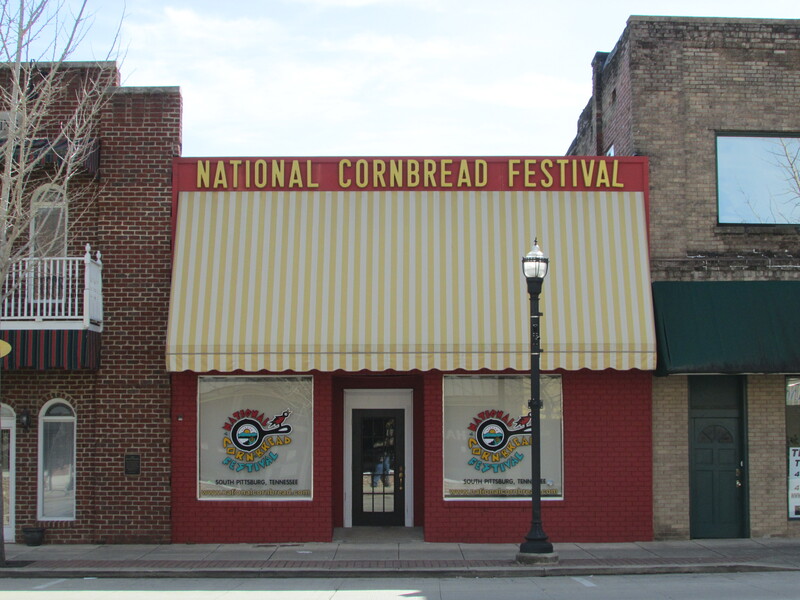 It should be no surprise that the home of cast iron skillets is also home to the National Cornbread Festival on the last full weekend in April. The calendar of events includes all kinds of cornbread cook-offs, “Cornbread Eatin’, Buttermilk Chuggin’, and Ice Cream Eatin’ Contests,” and the crowning of a slew of Miss National Cornbread Festivals from various age groups. A short walk through the cozy downtown reveals a historical marker commemorating South Pittsburg’s baffling and sad “Christmas Night Shootout” of 1927. I am interested in the history of the labor movement in the South, and especially in the Birmingham iron and steel industry, but the South Pittsburg event is news to me. It stemmed from a labor dispute at a local stove factory and pitted local law enforcement officers against one another. According to one account, the county sheriff and his deputies supported the strikers and the town police force sided with the factory owners. At the end of the shootout, six officers were killed including the Chief of Police and the Sheriff. On a happier note, down the street from the “Shootout” marker, I saw a coin-operated horse named Thunder on the sidewalk. I have not seen one of those in ages. It was in front of a music store (I think) that bills itself “The Most Unique Store in Tennessee.” I have to trust the sign since the store was closed when I was there. 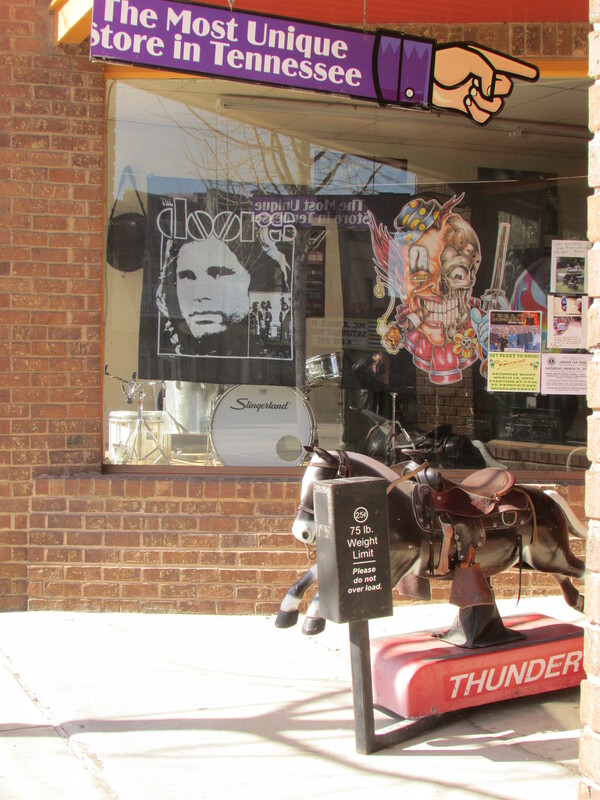 The fact that Jim Morrison was staring down at Thunder from an old Doors poster was delight enough and I’ll try to catch the unique store sometime when it’s open … perhaps at the next National Cornbread Festival. Take time to discover small towns. There’s always something interesting to learn. 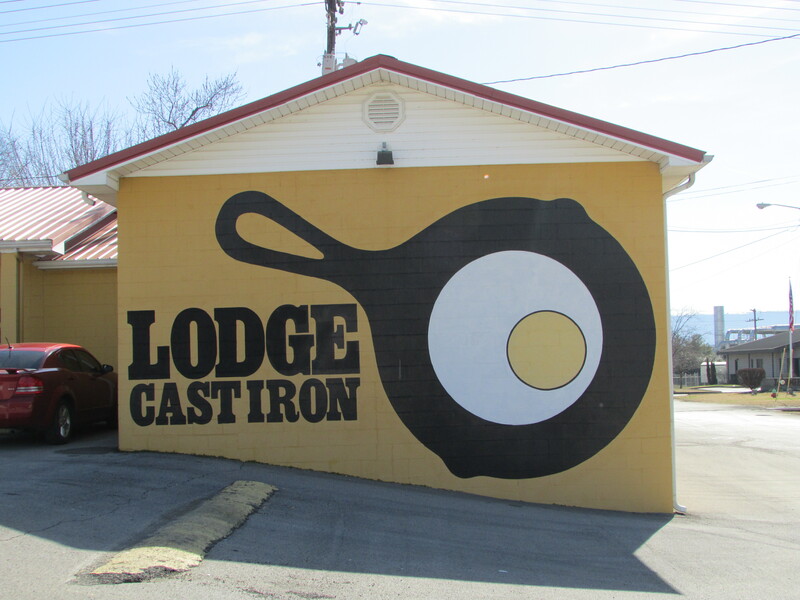 This entry was posted in Lodge Cast Iron, South Pittsburg, Tennessee and tagged Christmas Night Shootout of 1927, food, Lodge Manufacturing Co., National Cornbread Festival, South Pittsburg, the south, travel on March 11, 2015 by gedwardjourney.